In the description of uniform 'Scout Colours' refers to the traditional colours of Khaki, Blue, Green or Grey (with variation in shade allowed). Where options are provided, with the exception of Scouters the option chosen must be uniform within a Section. Shorts (BBS); of Grey colour, plain School type shorts and not the cargo style of shorts. Shorts lengths should to be worn 2" above the knees to maintain uniformity within the Wolf Cub Pack. Long Socks of Scout colours with two Scout Green (Emerald) rings on the downturns with Scout Green Garter Tabs. Headgear; Scout Green peaked cap with Yellow piping. Wolf Cub Scouters wear uniform as described for all Scout Group Scouters within the Scout Handbook. Shorts (BGS); of Grey colour, plain School type shorts and not the cargo style of shorts. Shorts lengths should to be worn 2" above the knees to maintain uniformity within the Wolf Cub Pack. Alternatively Girls may wear Grey School type skirts. 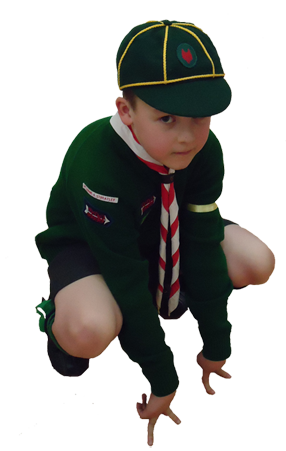 Wolf Cub Scouters, wear uniform as described for all Scout Group Scouters within the Scout Handbook. Neckerchief, Wolf Cubs wear neckerchiefs of Group colour worn with a woggle. Wolf Cub Scouters, when they are with their Group shall wear the neckerchief of the Scout Group. When Scouter are not with their Group they may wear either their Scout Group neckerchief or the 'Order of World Scout' neckerchief for those holding the 'Wood Badge' issued by the 'Order of World Scouts'. Shoes, must be of appropriate colour and must be standard within a section selected from black or brown. Wolf Cub Six Shoulder Patches, small triangular patch of felt cloth (the colour of the Six), sewn at the top of left sleeve, immediately below the shoulder, with point upwards. The base of the triangular patch is 4cm (40mm) with an angle of 60 degrees forming the triangle shape, basically making all sides 4cm (40mm) in length. To keep these regular and uniform in shape a cardboard cut out should be made and used as the standard former for future cutting of patches. Shoulder badge. Indicating the Group, worn on the right shoulder or on both, according to the custom of the group. Accessories, appropriate accessories can be worn suitable to any given occasion. Any variation of Uniform other than the permitted options cannot take place unless such departure from the scheme has a sufficiently good reason and is authorised by the local Commissioner in consultation with GHQ. In Uniform a cloth badge with the letters BBS or BGS superimposed in red on a white arrow with a black ground, worn mid-point between elbow and shoulder of the right sleeve; A cloth badge with a Red Wolf Head motif on a Scout Green background. A SECOND wears in addition, on the left breast of the jersey, one stripe of Yellow braid, 15mm wide forming a ring around the complete arm. A SIXER wears two stripes of Yellow braid as above set 15mm apart. A SENIOR SIXER wears three stripes of Yellow braid as above. Two general proficiency badges-First Star and Second Star. Special Proficiency badges - for different subjects. Wolf Cubs. The Tenderpad (a cloth badge with a Red Wolf's Head on a Scout Green ground) is worn in addition to the BBS or BGS Arrow Badge on the left breast with a second badge worn on the front and in the middle of the Cub Cap. (2) The First Star (Wolf Cubs) is worn on the cap on the right of the Wolf's Head. (3) The Second Star (Wolf Cubs) is worn on the cap on the left of the Wolf's Head. A motto is a guide to living. The Wolf Cub Motto means that you should remember to do your best in everything you try. Know the composition of the Union Flag and the way to fly it. Know in a very simple form the stories of the Saints of England, Scotland and Ireland. Recite the first and third verses of "God save the Queen" and know what to do when it is played or sung. Be able to tie the following and demonstrate their uses: reef knot and sheet bend. Leap over another Wolf Cub of the same size. Throw a ball six times so that a Wolf Cub ten metres away can catch it. Catch a ball, both hands together, thrown to him/her from a distance of ten metres, four times out of six. Walk upright and with a good carriage, carrying a solid article weighing about 1kg. on his/her head without using his/her hands, for a distance of ten metres; turn and come back to the starting point. A Wolf Cub cap may be worn. Know why and how he/she should keep his/her hands and feet clean, his/her nails clean and cut, and his/her teeth clean, and why breathe through his/her nose; and be carrying these things in practice. Be able to tell the time by an analogue clock. (a) A bulb in water; peat, moss, sand or soil. (b) A Chestnut or acorn in water, peat, moss, sand or soil. (c) Mustard and Cress, Peas or Beans on flannel. Clean a pair of boots or shoes, fold his/her clothes neatly and satisfy his/her Cub Master that he/she is doing his/her best to keep the Wolf Cub Den tidy and to leave no litter anywhere. Show that he/she understands the meaning of the Highway Code First Part - the road user on foot. Have at least three months satisfactory service as a Wolf Cub. Re-pass the Tenderpad test. This test to be taken last. Swim 15 metres, or skip with both feet together 15 times forward and 15 backward, the Wolf Cub turning the rope him/herself. Use a compass to show a knowledge of the eight principal points. Be able to tie the following and demonstrate their uses:- Bowline and Round Turn and two half hitches. Understand the meaning of thrift in all things and be carrying it out in practice. Show evidence of care of his/her Wolf Cub Uniform. Produce a satisfactory model or article made entirely by his/herself in wood, metal, cardboard, clay, plasticine, or similar substance; or an article knitted or netted, woven or carved; or a set of at least eight sketches drawn by his/herself in colours (chalk or print) of national flags, or animals, or flowers, with the name clearly written. Models made in partly constructed materials are not admissible. Lay and light a fire, indoors or out of doors. Run or cycle over a stated route with a verbal message of 15 to 20 words, including figures and repeat it correctly. Be able to use the public telephone; know where and how to ask for assistance in an emergency (ambulance, fire and police). Show how to clean and dress a cut finger and cover a scald or burn. Understand the danger of dirt to a scratch. Know the simple treatment for shock (not electric). Understand the necessity for summoning adult help. Observe and point out from life three birds (not domestic), three trees, and three other natural things such as insects, flowers, fishes, the choice to be made by the Wolf Cub in each case. Demonstrate the safe way to strike a match, guard a fire and handle an iron. Understand the dangers of broken glass, rusty nails and frayed electric flex. Know the safe way to plug in and disconnect domestic electrical appliances; or how to light a gas fire or ring; or how to light oil stoves or lamps. Have at least nine months satisfactory service as a Wolf Cub. The Leaping Wolf badge will be awarded to a Wolf Cub who has gained his/her Second Star badge and three special proficiency badges, one of which must be the First Aider, Guide or House Orderly badge. This he/she can wear while in the Wolf Cub Pack and when he/she goes up into the troop until he/she has passed his/her second Class tests. The Leaping Wolf badge will be worn over the right breast. Draw, in the presence of the Examiner, with pencil, brush pen or crayon an original illustration of any incident or character in a simple story (size not less than 180mm by 125mm). (a) Draw from life or memory, in pen and ink or pencil, any animal or human being. (b) Draw from nature a landscape or still-life group. (c) Keep a sketch book for a period of three months. (d) Illustrate a story by means of match-stick figures in a series of not less than four pictures. (e) Make a simple greeting card self designed using pencil, brush, pen or crayon. (f) Make a model in clay, pyruma, or other plastic material. These tests are divided into two classes, A and B. Class A is for Candidates 8-10 years of age; Class B for those over 10. The tests are of the same nature in both classes, but standards are different. (If a Candidate is unusually developed in this class he/she should by judged in class B. If a Candidate in class B is under-developed he/she should be judged by Class A). Sprint 50 metres in 11 seconds. Jump 2 metres (long jump). Throw a cricket ball 20 metres and catch one thrown from 10 metres. Sprint 50 metres in 10 seconds. Jump 2.5 metres (long jump). Climb a tree at least 4.5 metres, or climb a rope at least 3 metres. Throw a cricket ball 25 metres and catch one thrown from 12 metres. The Candidate must produce a list of books he/she has read in the previous year, name their authors and be able to tell the examiner something about the story of three of the books. The Three books to be chosen by the Candidate. The three books must be of a reasonable standard, taking into account the Candidate's age and development. Read aloud a simple piece of prose or poetry chosen by the Examiner. The Candidate must show that he/she understands how to care for books and make a dust cover and entitle it neatly. The Candidate must show that he/she can use a dictionary. keep a scrapbook dairy of events, etc., for a period of at least three months. Own or have regular use of a bicycle of proper size. Be able to mount and dismount properly. Be able to clean and oil the bicycle and pump up the tyres. Understand the need for keeping the bicycle in a roadworthy condition. Under observation go for a short ride on a specific course, showing a knowledge of the proper use of signals and rules for the road-user on wheels and extra rules for cycles in the Highway Code. (Note for the Examiner: The route shall be if possible include a crossroads, pedestrian crossing, right hand turn and roundabout). A Candidate who has passed the Cycling Proficiency Test for the Royal Society for the Prevention of Accidents qualifies automatically for parts (2),(3) and (4) of this badge. Be able to give a satisfactory performance in any of the two following:- Playing a musical instrument (2 tunes); singing (2 songs); reciting; acting or miming; puppetry; conjuring. (The first two alternatives to be well-known tunes; the performance for each of the latter alternatives to last at least three minutes). The Candidate must show that he/she knows the meaning of 'First Aid' and the need for summoning adult help. Show how to dress minor cuts and grazes and know the importance of cleanliness and the use of disposable gloves in treatment. Demonstrate simple roller bandaging of a hand and a knee. Know the common causes of burns and scalds in the home and their prevention; how to put out burning clothing; the simple treatment of burns and scalds. Know the symptoms of, and how to treat shock, resulting from burns or accidents. Care for and cultivate a patch of garden at least 1.25 metres square, preferably a square in shape, for at least four months. Be able to demonstrate the use of, and how to care for, the following tools; spade, folk, hoe, trowel, rake. or, in the case of areas where patches of garden are impossible, the following alternative test can be taken in place of (1) and (2):- Grow from seed three different plants in pots or in a window box for at least four months. (c) Three common friends of the garden. Be able to give clear and concise directions, well expressed and distinctly spoken, to a stranger asking the way, and do so politely and promptly. Know the whereabouts of the nearest police station, doctor, chemist, public telephone, railway station, petrol station, motor garage and hotel. Know how to call for Fire, Police, Ambulance. In towns: know the number, if any, and at least two places each way on the route of the local buses up to a maximum of four routes. In the country: know the route of the local bus or buses. ake an article from odds and ends such as fir cones, clothes, pegs, etc., or recondition 2 durable toys approved by the SM. Make a pot of tea: and either grill bacon and sausage, or fry or poach an egg. Prepare potatoes, and boil or bake or fry them. Make a bed, wash up crockery, utensils etc,. Clean windows, and silver or brasswork. Clean and tidy a room. Lay a table for at least 3 people for a meal of two courses. (c) Keep in reasonable detail, a nature log for a period of at least 3 months. The Candidate must find his/her way to an unknown spot, between 300 and 400 metres away, by following directions given to him/her by the Examiner (either compass directions, or signs made on the ground, or landmarks, or a combination of these. (3) Be able to play Kim's Game, nine objects out of twelve. Know the alphabet in Semaphore or Morse, paying special attention to correct positions in Semaphore, or the timing of Morse. Be able to send and read a short simple message of 10 words slowly but getting 8 out of 10 correct. (viz., general answer, numbers, letters and erase). Demonstrate the special signs in 'Scouting for Boys'. Exchange a message by using a 'secret' code to be chosen or invented by the Candidate. Know the rules or laws of two team games such as Rugby football, Association football, cricket, hockey, rounders. Show reasonable proficiency and be taking an active part in at least one of these. Show a good sportsmanlike spirit in all Cub games and activities. Note: A written note of confirmation or Certificates must be produced for test (2) from either SM or Schoolteacher and test (3) from SM. Be able to swim 25 metre (any stroke except backstroke). Swim on back for 15 metres. be able to float on back for 60 seconds in salt water or 30 seconds in fresh water, or tread water for two minutes in salt water or one minute in fresh water. Be able to 'duck dive' (i.e. dive while standing in the water or swimming), or (as alternative), perform a 'honey-pot', (i.e. jump with arms clasped round knees), from a board, bank, or boat, or dive from the side of the bath. Appendix A. Wolf Cub Sixes and Colours. A Wolf Cub Pack must form part of a BBS Scout Group, and the Scout Group must register the Wolf Cub Pack under their Scout Group Registration, as for all Sections. The Wolf Cub Scouters must apply for the appropriate warrant for their rank, the forms for which are available from the Group Scout Master or from the BBS Headquarters. Please note that a Wolf Cub Pack may be permitted to be formed in advance of a full Scout Group being established with the approval of the BBS Headquarters. The Association's policies and procedure for these are obtainable on request from the BBS Headquarters. All warranted Scouters will need to complete forms relating to these policies and undergo checks to ensure that the Association policies are being fully complied with. The Scout Group is responsible for its Public Liability and any Personal Injury insurance that must be in line with the BBS Headquarters' requirements, in order to qualify for registration of the Association. The ranks for leaders follow similar to those in the other Sections of the Scout Group and are all warranted posts, in order of rank is the 'Cubmaster' (CM) or 'Lady Cubmaster' (CM), then the assistants referred to as 'Assistant Cubmaster' (ACM) or 'Lady Assistant Cubmaster' (ACM). The Cubmaster may, with the approval of the Group Scout Master and Scout Master concerned, obtain the services, as a 'Cub Instructor' of a Scout (who must have reached the age of 15 years or hold the 'First Class Badge' or a Senior Scout, or a Guide (who must have reached the age of 15 year) with the approval of the Guide Captain. In addition a girl not a member of the Guide Movement and reached the age of 15 years, after serving a probationary period of 6 months service, again with the approval of the Group Scout Master, may become a 'Cub Instructor'. The titles or names for the Wolf Cub Scouters are traditionally taken from 'The Jungle Book' as is the theme for the Wolf Cubs. Therefore the name 'AKELA' must be used for the Cubmaster. Names for Assistant Cubmasters and any adult helpers will be left to the discretion of the Section concerned, but the names that can be selected from are those found in 'The Jungle Book' story, but only using the good, well meaning animal names like - 'BALOO'; 'BAGHERRA'; 'KAA'; 'RAKSHA'; 'RIKKI-TIKKI-TAVI'; 'HATHI'; 'CHIL', as typical examples. The training of Wolf Cub Scouters follows the same course as for all other Sections, consisting of a 'Preliminary Training Course' (PTC) that will probably be carried out over a weekend, or two day sessions or maybe several evening sessions. At the end of the course a Certificate will be issued and a two-stranded Turk's Head Woggle will be presented. Following this will be the 'Part 2 Pratical Residential Course' over a long weekend or several short weekends, in which the practical skills of Scouting will be presented. A further Certificate will be issued on Completion of 'Part 2'. Whilst the above is not compulsory, it is hoped that all Scouters will want to become as proficient as possible and will undertake that training. We can all benefit from an exchange of ideas which is inevitably a product of such training. SAFETY IN THE PACK MEETINGS - Where there are boisterous games it is necessary to remove out of harm's way all things that are likely to cause injury, e.g. tables and chairs, ropes and other equipment not required for that game and especially sharp or pointed objects. Look out for things likely to lead to accidents. SAFETY ON THE ROAD - The 'Green Cross Code' is an essential part of our Scouting programme and all Wolf Cubs should be taught this, and always ensure that when you are out with the Wolf Cubs you make a point of being seen to abide by the 'Green Cross Code' to the Wolf Cubs If the situation of your meeting hall is one that the Wolf Cubs need to leave by crossing a road, then ensure that there is a Scouter appointed to that role of safely crossing the Wolf Cubs. PARENTS - should be asked to ensure that they are there on time to deliver and collect their child before and after each meeting, but still ensure that there is at least one Scouter on any exit door to supervise the arrival and departure of the Wolf Cubs at each meeting. In addition sections of the 'Highway Code' appropriate to pedestrians or other activities that the Wolf Cub Pack might be involved in (cycling as an example) should be taught and practiced. FIRST AID - All Wolf Cub Packs should have to immediate hand a comprehensive First Aid Kit. This should contain the normal requirements items for dealing with cuts and scratches, grazes and bruises. In addition a small note book to record any details of injuries sustained and the treatment given and by whom, along with the name of the Wolf Cub, the date and time and finally the location. A current edition of the First Aid Manual issued by the British Red Cross or similar authority must be kept in the First Aid Kit. Wherever possible one of the Scouters in the Wolf Cub Pack should be trained in First Aid and preferably hold a valid STA 'Activity First Aid' and 'Emergency First Aid At Work' Certificate, or have attended a First Aid Course offered by the British Red Cross or similar authority to the same level. WOLF CUB MEETINGS should be arranged to suit the age group. Meeting lengths of time are normally between one and a half hours to two hours, and of course as much as possible within the programme should be arranged for outdoor activities. On occasions it might be considered appropriate to hold a 'SIXERS' COUNCIL', an informal meeting of Wolf Cub Scouters, the Sixers, and, if desired the Seconds. The function of the 'Sixers' Council' is to discuss internal administrative and programme matters and for the Cubmasters consult the Sixers over these. It is advisable that a 'WOLF CUB COUNCIL' meeting should be held at regular intervals. This is an informal meeting of the Wolf Cub Scouters with any other adults working with the Section, to discuss programmes and activities. Membership subscriptions should be levied on the individual Wolf Cub. This should be determined by the Group Scout Master in consultation with the Cubmaster and should be a reasonable amount, bearing in mind local conditions and expenses incurred in running the Wolf Cub Pack as a part of the Scout Group. The monies must be properly accounted for and banked with the Scout Group Treasurer, and the monies expended at the discretion of the Group Scout Master in consultation with the Cubmaster. A float could be issued for the Cubmaster's accountable cash purchases for the Wolf Cub Pack. Both Boys and Girls are eligible to join this Section when they have attained the age of 7.5 years . They transfer to the Scouts when they have achieved the age of 10.5/11 years. 10.5 years if they have passed all their tests and gained the 'Leaping Wolf'. BBS & BGS ARROW BADGES - Two of these Association badges are worn, one on the right breast of the jersey and one on the right arm at the same height as the breast badge. ORDER OF WORLD SCOUTS BADGE - This badge is worn on the right breast of the jersey, just below the BBS & BGS Arrow badge. This badge is the badge worn by all members of the international 'Order of World Scouts' (OWS), the international membership badge for the Order founded on 11.11.1911. The Wolf Cub Pack cannot exist in isolation as it is, nor should be, it must be a Section of a Scout Group (unless a new group just forming with Wolf Cubs only to start with). There must be contact and interactions with the Beavers, Wolf Cub Pack and the Scout Troop on regular occasions to show a good Scouting example to the younger Sections, as well as knowing other Section Scouters and members of other Sections that they are members of a family in Scouting. Combined activities are very important and all Wolf Cubs should fully support these that may be organised by the Scout Group, such joint activities as parades; hikes; parent and members games; fetes and fund raising; Christmas parties, etc. Joint activities with young persons of comparable ages in other organisations such as the Brownies and other associations' Wolf Cub Sections, Church youth groups, or competitions with school teams are to be encouraged. As our aim is the promotion of our Scouting and all it stands for, and to be seen taking a useful role in community activities and society, we must therefore participate in outside activities and fully support these activities; and not permit the membership to be lukewarm in their participation of these joint or share activities, thereby letting the Scout Group down. We are principally a Christian Scout Association as such Church Parades and attendance at one's own Church is an essential element for Wolf Cubs in Scouting, embedded in its Wolf Cub Promise and Wolf Cub Law. Therefore Wolf Cubs must be encouraged to fully participate in all the Scout Group Church Parades, particularly the St. George's Day Church Parade where the Wolf Cubs re-affirm their Wolf Cub Promise and Wolf Cub Law. Monthly Church Parades are recommended in order to fulfil the important elements within the Wolf Cub Promise and Wolf Cub Law with minimum attendance targets set for members. Wolf Cubs should take pride in supporting all Church Parades, the marching, the Hymn singing, the pride in being seen in uniform and carrying their Section flag, thereby reinforcing their part played in the family of Scouting. And of course other young people see them and want to join. The programme of activities should be appropriate to the 7.5 and 11 year olds and for both boys and girls, particularly in mixed meetings. As well as outdoor activities the programme should consist of, amongst other things, games with a purpose to promote character building and self-reliance, a sense of duty to others, fun, sportsmanship and interest in the outdoors. Sample programmes can be obtained from the B.B.S. Headquarters on request. NOTE : WOLF CUB PROGRESS CHARTS (A3 DISPLAY CHARTS FOR WALL HANGING) CAN BE OBTAINED FROM THE BBS HEADQUARTERS ON REQUEST. This is a very short version of how Mowgli, the wood-cutter's boy was adopted into the Seeonee Wolf Pack. The full story is in the Rudyard Kipling's 'First Jungle Book', or in the shortened version 'All the Mowgli Stories'. This short version is well suited to be read to the Wolf Cub age group. It all started when, on a warm summer evening, in the heart of the Seeonee Jungle, by the banks of the Waingunga River, the Seeonee Wolf Pack was waking up for its night's hunting. One family of wolves, Father Wolf, Mother Wolf (who was called 'Raksha') and their three sons, lived in a lair on the hunting grounds. Just s Father Wolf was preparing to go out and hunt, they all heard the roar of a Tiger down in the valley. Now, there was only one Tiger in the area, and that was 'Shere-Khan', who was a bad Tiger. Just as in the Cub Pack, the Wolves had their Laws, two of which I will tell you now. The first is that you may only hunt in your own hunting ground, and nobody may trespass onto another's. If you cannot for some reason hunt in your own grounds, then you must ask permission to use another's, and you may not use it until that permission is granted. The second is that the animals of the Forest may not hunt man the reason being that man will then come and hunt them. Now, Shere-Khan had broken both these Laws, as he was out of his own hunting ground, AND the was hunting MAN. Shere-Khan was a lazy Tiger, and found it easier to hunt Man than Animals, as they were easy prey. Well, as the roar of the Tiger became stronger, the Wolves realised what he was hunting, and became silent, to hear the outcome. The outcome came quite soon, and was made apparent by the hunting roar turning into a roar of terror. This pleased the Wolves, as it meant that something had gone wrong, and the Humans had escaped. At the same time as the roar subsided, the Wolves had a visitor, in the shape of Tabaqui, the Jackal. The Jackal is a lazy animal who will not hunt, but lives off the food that the Wolves and the Tigers leave behind. So, Tabaqui arrived at the Wolves Lair, and walked straight in. He looked around, and found some bones that the Wolves had left, and so he began to gorge himself. In between mouth-fulls he told the Wolves (quite unnecessarily) that Shere-Khan had changed hunting grounds. That was when Mother Wolf threw him out. Father Wolf then decided that it was really time for him to go and do some hunting, to provide the family with its meal; so he left the Lair, and was preparing to go down the hill, when there was a movement in the bushes. He immediately became immobile, and got ready to jump onto whatever food there might be there; then, when the animal broke through, Father Wolf leaped, and realised at the same time that it was a MAN CUB that had appeared, so he tried to stop himself; the consequence was, that he jumped straight up in the air, and landed from where he had taken off. His curiosity aroused, he went over to the Man Cub, picked him up and took him to Mother Wolf, who had never seen one before. As soon as Father Wolf set him down again, Mowgli went over, and started feeding from Mother Wolf. This decided Mother Wolf to keep him in the Pack, and bring him up as a wolf, instead of a man. So for a long time, Mowgli ran with the Pack, until he had learned the Laws of the Jungle (and there were many), and he was ready to become an 'Adult Wolf'. These Laws he was taught by 'Baloo', the big Brown Bear, who taught all the Cubs the Laws of the Jungle. So Mother wolf took Mowgli up to the Council Rock one meeting time, so that he could be 'Looked Over' by the rest of the Pack, this meant that the other wolves would file past him, and look at him closely to be able to recognise him at any time. However, one of the Laws of the Jungle stated that if there was a dispute as to whether a Cub could become a member of the Pack, his entry could be brought; and Mowgli caused a dispute, Shere-Khan had wanted him from the moment that he had missed him, so he asked for him at the 'Looking Over' in none too polite a way. So, two members of the Pack (and not the Father and Mother) had to speak up for Mowgli. The first one was Baloo, who although not a member of the Pack, was permitted to take part in the Grand Howl. But there did not appear to be a second. However, out of one of the trees there dropped a smooth black shape, which brought silence to the circle through its presence. It was Bagherra, the Black Panther, whose path none of the wolves cared to cross. Bagherra walked into the centre of the circle, and addressed Akela, who was the leader. Knowing that he was not permitted to be there, he apologised, and asked for permission to speak. This Akela granted. Bagherra then quoted the Law, and stated that he had freshly killed a bullock, and offered it for Mowgli's life. The Pack accepted and that, in short is how Mowgli entered the Seeonee Wolf Pack. Wolf Cubs remember that you have promised to do a good turn to someone every day. A Wolf Cub must always be looking for ways to help other people, like the Knights of old, and can often do more than one good turn or act of kindness in a day. True Wolf Cubs and Scouts are always happy to help others. At home you can ask to do an extra job, and at school or church you can be polite and see if you can help with anything. Be ready to carry things, to give up your seat in a crowded bus, to open doors for elderly, handicapped persons or Mums with prams. Give water to thirsty and look after your pets. Clean a neighbour's car or help with the gardening. If you have a handicapped neighbour or relative, visit them to see if you can make their life a little better and brighter. Raise money for good causes, collect games and books for children in hospital. A good turn need not be a big thing. But Remember To Check With Your Parents And Get Their Approval, Before You Intend Doing A Good Turn Outside Of Your Home For Other People. Good Hunting and Wishing You a Great Cubbing Future.